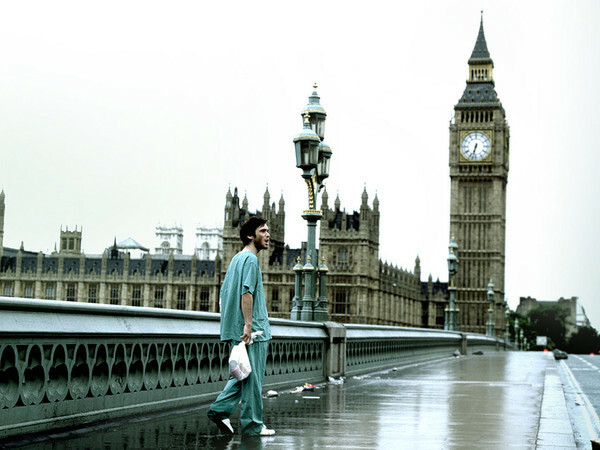 There is something about the simplicity and low-key feel of 28 Days Later which makes it so effective. This isn’t a glossy, Hollywood horror film but something much more realistic. Throughout the movie there is an impending feeling of dread as the situation for the main character becomes more and more gloomy and any hope becomes lost. This begins with that now iconic first act sequence. 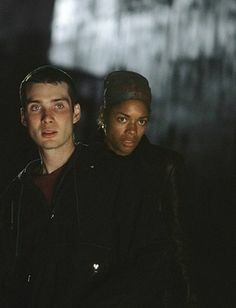 Before the titles there is the origin of the “outbreak” but it is when the confused, dazed and recently awoken Jim, played by a perfect “everyman” in Cillian Murphy, is walking through the deserted streets of the usually bustling, busy and noisy London, that the terror of the situation really hits home. This is a genuine national disaster and although the audience know what has happened (or at least know more than he does), Jim’s ignorance is a huge factor in selling these first few moments. The opening sequence and the bizarre, deserted streets is not the only horror in the movie but the movie never resorts to “cattle-prod scares.” There is never a moment when people are walking tentatively down a deserted corridor, waiting for the huge jump-scare. This is a movie where the situation scares you, never resorting to the cheap scare. This means that when the “zombies” are running through the streets, chasing our heroes, it makes for a much more frantic and effective movie. You feel their tiredness, their desperation and alternatively their relief in the few “down-time” moments they get between the survival ones. This is also helped in the characters that surround Murphy’s Jim. 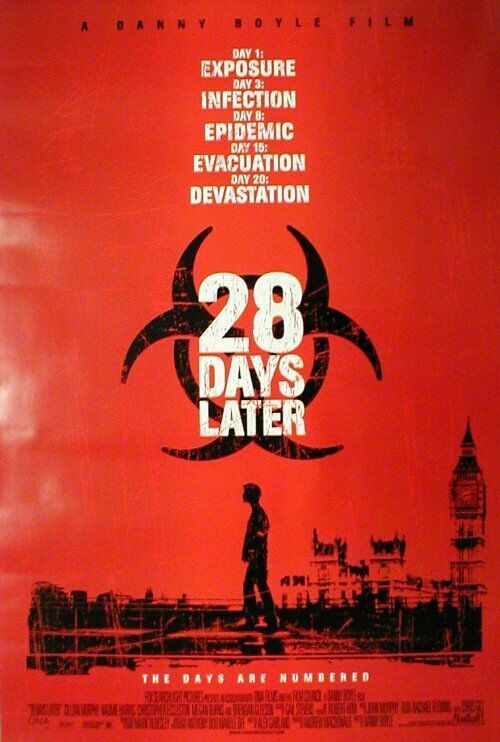 28 Days Later are early roles for new Moneypenny Naomie Harris, playing the fearless and unforgiving Selena, while The Guard‘s Brendan Gleeson plays Frank, trying to get to a “safe-point” with his young daughter. It makes for an unconventional family but the key to any movie, particularly horror ones, is getting the audience to root for the characters and this manages it so well. There are other characters too, namely soldiers at the “safe-point” led by Doctor Who actor Christopher Eccleston. It is here that the some of the biggest horror moments in the movie play out and the third act changes the dynamic between characters once more. Like any good zombie movie, the film isn’t about the hording undead but the survival instincts of the survivors and the relationships this creates. It is to his credit that Danny Boyle manages to create such a convincing, effective and downright tense horror movie on what is clearly a low-budget. At no time does this feel small-time or undersold and iconic scenes like the deserted London or the city of Manchester on fire, manage to give the movie a scale that would stretch the budget but inspire the imagination. 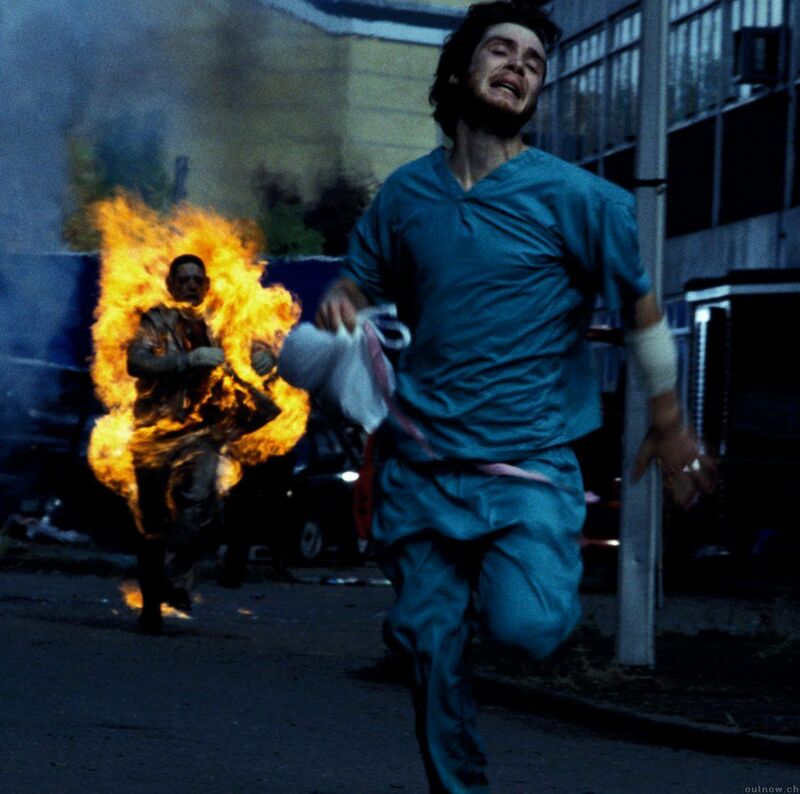 Overall, 28 Days Later is a British horror movie triumph. From Cillian Murphy wandering lonely through a deserted London to the frantic final act, the film keeps the audience on the edge of their seat. Like any “zombie” film, this is about the characters and relationships and the movie has enough of this to keep it interesting. A low-budget success. Hah I just posted my 28 Weeks Later review but yeah nice review, modern horror classic with great use of tension, a credit to how versatile Danny Boyle is as a director. I still haven’t seen 28 Weeks Later, it is on my list to watch though. You are right about Boyle too and that it is a modern horror classic. Previous Previous post: Horror Week: The Launch!